Every night I search for an answer I know I won't find. I search for a way to justify the way I feel or a way to convince myself what I'm feeling is normal. But I know it's true: I am suffering from postpartum depression. It's two a.m. and I'm not sleeping. Again. My newborn son has finally fallen asleep. I have been waiting for this moment all day. I'm exhausted. I should be sleeping. Instead, I'm sitting in bed scrolling through message boards on my phone, falling into a dark hole of anxiety. I type question after question: "Is he eating enough?" "Is his poop normal? ", "Am I interacting enough?" The questions go on and on. I know I need to sleep, I know the baby will be up in a short hour. But I can't calm my mind. I waited my entire life to be a mom. I spent my pregnancy on cloud nine researching products and organizing a perfect nursery and daydreaming about my baby. After the birth of my son, I was overjoyed. I had an easy delivery (as easy as a C-section can go) and after five days, I was excited to go home. I knew I would face challenges, but I thought the love for my son would overpower them. Those first few weeks were a blur. I felt anxious about everything. I couldn't shake the feeling that I wasn't bonding with my baby. I felt overwhelmed by simple tasks. I would dread the end of the day, not wanting to face another never-ending night of doom and despair. I had many supportive visitors. I'd slap on a smile, becoming an expert at masking my depression; afraid of the judgment I'd receive if people knew the truth. I loved my son, so I chalked my anxieties up to the "baby blues" which the internet says dissipate around six weeks. So, I waited. Six weeks came and went. As I emerged out of the fog of the newborn days my anxiety only became sharper. Every day would end in tears. When my husband asked me how I was, I'd sob uncontrollably and say I felt alone and like a failure and I had no idea why. I had scary visions. I pictured my son falling out of my arms and tumbling down the stairs and cracking his skull open. I stood at the top of the stairs, paralyzed. I pictured him cold and blue, dead in his bassinet. I'd wake up and pat the bed frantically, searching for his unresponsive body, only to turn to my left to see him sleeping peacefully. I would hold my baby and try to force myself to feel the love that I knew I felt. Because I did love my son, more than I thought was possible. But there were days I would stare down at his perfect little face and feel nothing. And it tore my heart apart. I felt like such a failure. A good mother would never think these thoughts, right? I felt selfish. If I really loved my child I would stop these negative thoughts and perceiver, right? I was terrified to admit how I felt, afraid to sound whiny or like I was looking for pity. I wanted to be like the strong and confident mothers that I felt were all around me. I felt so alone and sad. Postpartum depression felt like I was grieving a loss of something that I never knew. I finally hit my breaking point. One night my husband and I were chatting before bed. I started crying and couldn't contain myself. I ran outside and crawled into the backseat of my car and wailed for ten minutes. I didn't want my husband or my baby to see me. I didn't want to see myself. I gained the courage to walk back inside. I asked my husband, "Do you think something is wrong with me?" I could see the fear in his eyes; he didn't want to say the wrong thing. I sat down and bawled. Finally I whispered, "I need help." All the thoughts that had been haunting me for the past seven weeks poured out. I explained that I worry he doesn't love me anymore because I turned into a monster since the birth of our son and that I believe our baby doesn't love me and never would. The following morning I went to the doctor. Sweaty and shaking, I told her everything. She looked me in the eye and said, "I'm so glad you came." She explained that more women than I think feel like this. That there is nothing to be shameful of, motherhood is hard. She recommended I start taking Lexapro, explaining that the side effects of having a depressed mother were certainly worse than any side effects of the drug in my milk. I walked away with a confidence I hadn't felt since before giving birth. I was ready to take care of myself. It's been four months since I started my recovery and I'm still taking one day at a time. There are still hard days that end in tears, but the good days outnumber the bad. Knowing that I am taking the best care of myself, and in turn my son, gets me through. The American Psychological Association states that 1 in 7 women will experience postpartum depression. It is much more common than you think. I share my story to encourage others to speak up and get help. The more we share our stories, the more we will diminish the stigma surrounding postpartum depression. My debut into motherhood was nothing like I expected, and it left me broken. But, my true, loving, strong self was hidden beneath those crippling thoughts. Support is out there. I only wish I would have sought it sooner. A version of this post originally appeared on Katie's blog A Beautiful Little Adventure. 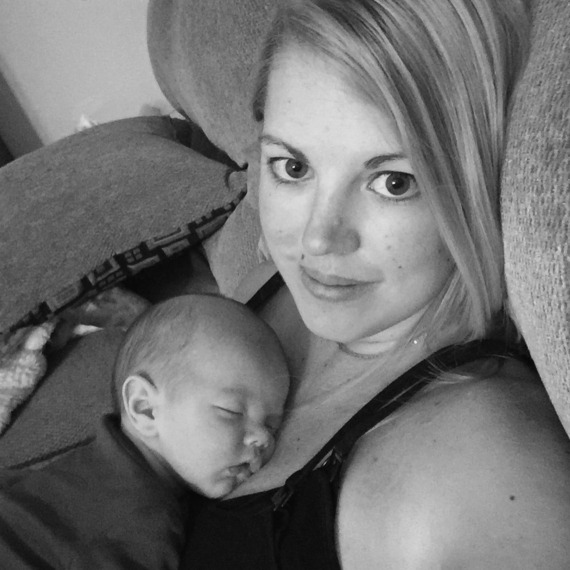 Katie is a new mom and writer trying to navigate through this life one cup of coffee and nap at a time. She and her husband, son, and poodle mix live in Central PA where you can find her either reading, jogging, or shopping for baby clothes. She believes a meal can be made up of appetizers and sleep should always come before housework. Her blog A Beautiful Little Adventure. Instagram and Facebook. If you are experiencing symptoms of postpartum depression, please reach out to your healthcare provider.